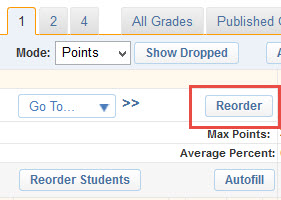 To reorder assignments, click the Reorder button near the top left of the Gradebook spreadsheet. Select Add new to left or Add new to right, and click Submit. Use the drag and drop interface to customize the order of your assignments, then click Submit. Once submitted, the changes made will be reflected in the Gradebook.